Music is miraculous for the mind. It can produce extraordinary images in dreams and help recall past memories. My life is full of music and I honestly don’t know who I would be or how I would handle my day-to-day without it. In 1993, Crowded House released their multi-platinum album entitled “Together Alone”. It’s both intimate and expansive. One song makes you want to hold onto the person or thing you love the most and another makes you want to kick open a door and bounce from wall to wall. 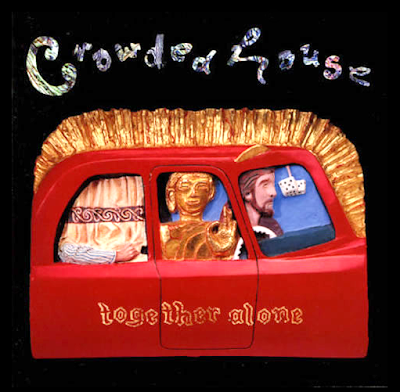 It’s a complete album and in my opinion Crowded House’s best. New Zealand band Crowded House was famous in the 1980s with classic hits such as “Don’t Dream It’s Over” and “Something So Strong”. 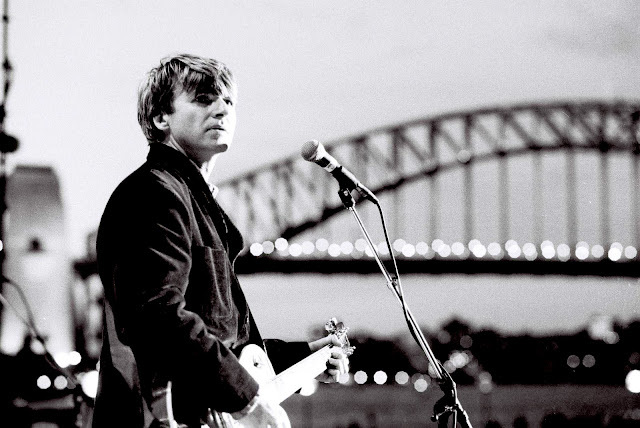 Front man Neil Finn has a rich history in music including stints in previous band Split Enz and solo work with his brother Tim (who has also contributed much to Crowded House over the years). Their music is mostly lead by Neil but "Together Alone" appears to be a more collaborative effort utilizing the rest of the band's incredible talent: Paul Hester on drums, Nick Seymour on bass and multi-instrumentalist Mark Hart. Their music is categorized as rock, pop rock, alternative rock, and new wave. “Together Alone” is distinctive from previous albums with its use of multi-layered guitars and tribal influences. The tribal sound can be heard in such tracks as “Kare Kare”, “Together Alone” and “Private Universe”. It’s also closer to a concept album rather than a collection of pop tracks. In fact, the only real pop-rock track is “Locked Out”. The music video unfortunately had a low amount of screen time in America but could have introduced the band to a new and younger audience. It’s a great rock tune with a dirty electric guitar and melodic vocals. And despite the rock energy of “Locked Out”, the album also includes tracks like “Walking On The Spot”, a tune lead by gorgeous vocals and a calming piano. “Pineapple Head” is similar in mood but differs with its use of mandolin. “Private Universe” is romantic and worldly with its use of deep, echoic percussions and tightly strumming acoustic guitars. One of the first singles released from the album was “Distant Sun” and it’s this track that has the ability to connect with the most diverse of groups. It’s simple and heart warming. Neil Finn has a unique ability to write seemingly straightforward and yet meaningful lyrics. His style has inspired my writing for decades and continues to do so. The entire album can be summed up with one line from “Distant Sun”: I don’t pretend to know what you want, but I offer love. I’m not sure how a line so simple can be so powerful but Finn is a master of this style. Since I was a child, I’ve enjoyed studying the methods of literature, especially for lyrics. My conclusions all point towards the more simplistic a sentence the more impact it makes. Think of your favorite lines for a song or even dialogue from a film and notice the simplicity. An example is Frank Darabont’s film The Shawshank Redemption with Andy Dufresne’s line: Get busy living or get busy dying. It’s an incredible line that sums up everything that Andy has strived to learn about his life. The album concludes with the track “Together Alone” and reintroduces the tribal elements found sporadically within the album. It utilizes a New Zealand Māori choir, which helps bookend the album with a spiritual flavor. The song ends in a heartfelt chant and leaves you ready to start back at the beginning with “Kare Kare”. It’s the album’s starting point and an ode to Karekare, a small coastal settlement in northern New Zealand. “Together Alone” is as fresh today as it was in 1993. It remains one of my all time favorite albums and continues to inspire ideas and induce feelings. It’s beautiful, it’s exciting, it’s gentle, it’s ferocious, it’s innovative, and it’s one of a kind. And in this case, it isn’t just good for the mind, but also for the heart. A stronger recommendation I cannot give. TRIVIA: “Together Alone” was certified Gold* and Platinum** by the RIAA in several countries including: Australia (Platinum), New Zealand (Double-Platinum), Canada (Gold), Spain (Gold), UK (Double-Platinum). *Gold = 500,000 units sold, **Platinum = 1,000,000 units sold.